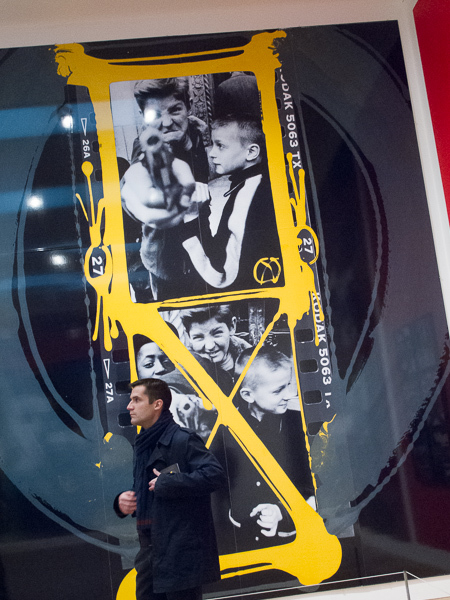 Tate Modern, London, has a well-executed exhibition of Klein and Moriyama’s photographs running until 20 January 2013. It is really 2 exhibitions in one; both artists’ careers are reviewed, and although the 2 artists are distinct, the more graphically inclined Klein is known to have been an early influence on Moriyama so it is appropriate that these two exhibitions are closely associated. The exhibitions are arranged thematically rather than strictly chronologically. This means that artistic development can be explored more explicitly, and is to the curator, Simon Baker’s, great credit. 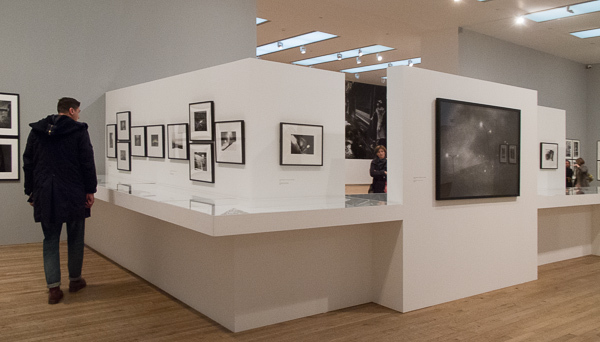 The Klein and Moriyama exhibitions overlap in the centre of the display where visitors looking at Moriyama prints can see through to the Klein exhibition and vice versa. My main interest was to see the Moriyama exhibition since, as I mentioned in a previous post, I am curious about Japanese photography. 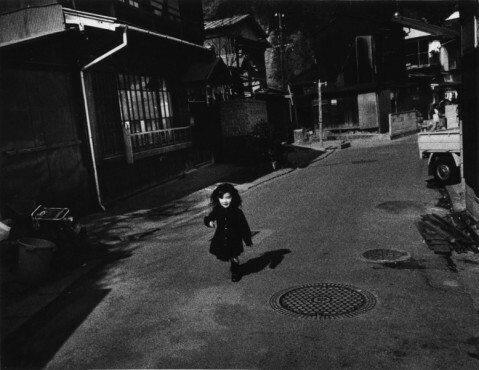 While there is a lot to like about the William Klein photos, I’m going to concentrate on Daido Moriyama. 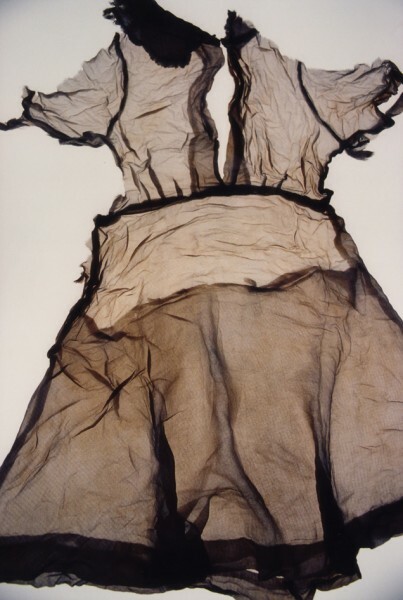 Enlarged images in the Klein exhibition show the use a mixed media. Something that Moriyama eschews. 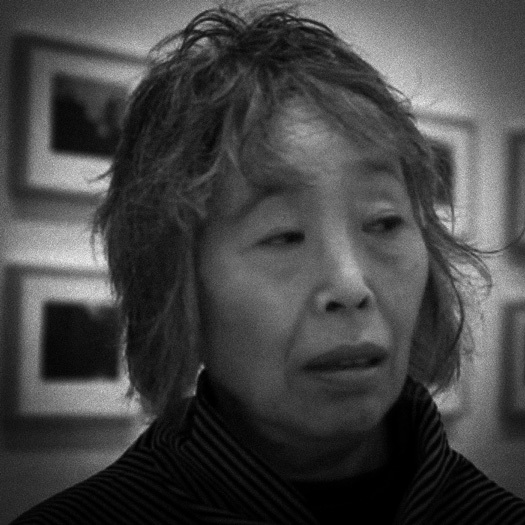 Moriyama (b.1938) not only learned the craft of photography from renowned Japanese masters, but explored artistic influences around the world. 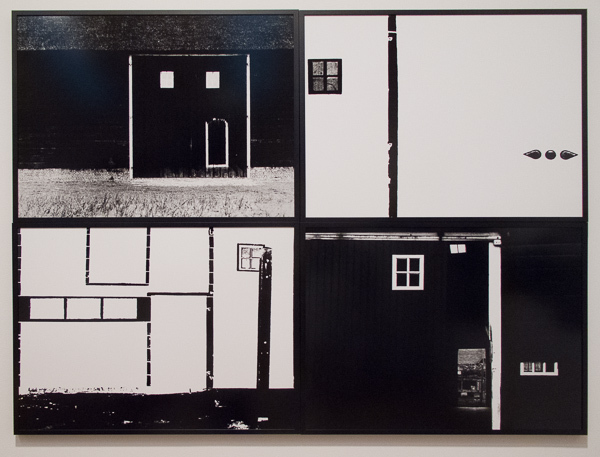 Here we see 4 images from 1954 (when he was 16) called “Holland=Mondrian” where he mimicked Mondrian’s grids, exploring the ability of the camera to produce abstract images. 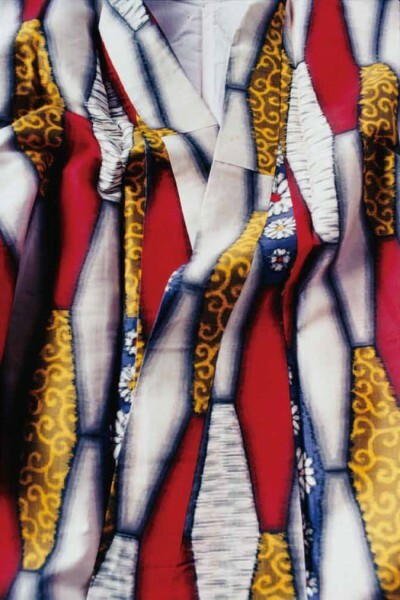 Although Moriyama’s early work shows a thirst to explore the photographic application of techniques used in painting, he soon began pushing the boundaries of photography without too much reference elsewhere. Adopting new techniques and ways of seeing means he quickly acquired the label “avant garde” . He abandons the idea of conventional composition and, like Klein, uses only the frame of the image to direct the viewer’s attention. In a sense this parallels Edward Weston’s idea that composition is simply “the strongest way of seeing” but with very different results. 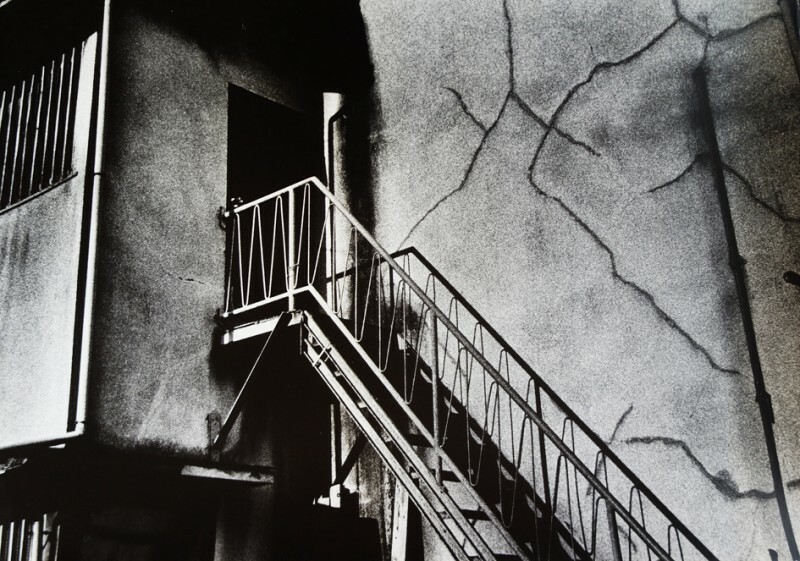 Moriyama’s images usually have more than one centre of interest to draw the eye, and in some images the interest is diffused across the entire frame so that the viewer’s eye explores ceaselessly. Moriyama shows the grubby corners of everyday street life (he is strongly drawn to cities) as if glimpsed while passing by. He emphasises this by putting his frames off-axis. He adds degrees of abstraction by using black & white film; by processing for grain and high contrast; by tilting the image, even as far as 90° or in one case, 180°; using close-focus to distort perspective; using such tight framing that we are left to guess the majority of the scene; blurring the image by slow shutter speed or out-of-focus settings. This is the “rough-shake-no focus” (are-buri-boke) style for which he is famous/infamous. In Japanese photographic theory, images can have “adhesion” or “fixation”. Araki believes that Moriyama has added “settlement” to this list [Araki interview in Diado Moryama: Stray Dog of Tokyo. 2001]. I take this to mean that even when taken and printed, an image is still a dynamic thing, open to interpretation and re-interpretation. We see an example of this in room 6 where Moriyama’s Stray Dog is repeatedly re-interpreted. 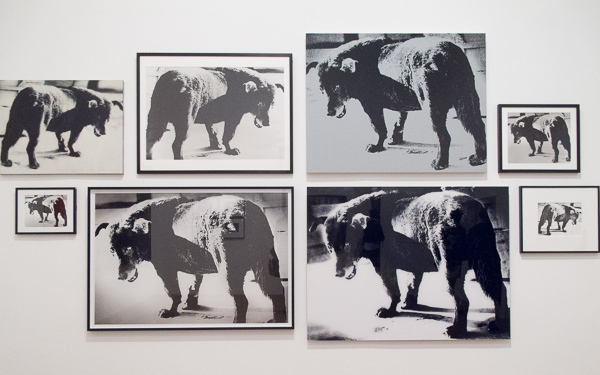 8 interpretations of Stray Dog, Moriyama’s signature image, which suggests his restlessness, dissatisfaction, and a striving for something different and better. Looking back through my notes, I notice that words like “game” and “play” crop up frequently in relation to Moriyama’s (and Klein’s) images. This, I think, is the most important lesson to take from Moriyama – not to lose a sense of play when exploring photography (or life, for that matter! (is there any difference!? )).